Which nutrients do we need? Minerals. Of the 92 naturally occurring elements on earth, we need 40 of them of which most are minerals, both major and trace minerals. 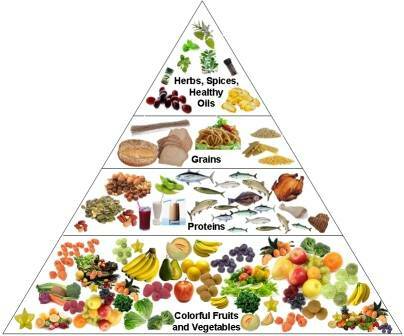 The nutrition pyramid above is more healthful than the usually promoted pyramid, which has grains at its base. What do we actually eat? It is a shocking fact that ~90% of the money spent on food in the U.S. is spent on processed foods (Fast Food Nation by Eric Schlosser, 2002, Penguin Books). Most of us eat and drink only for enjoyment and sustenance, giving little attention to whether we are obtaining needed nutrients in the correct balance to maintain health. Although America is the richest country in the world, it takes the “prize” for having the highest obesity rate (30% of the population). With some effort, however, it is possible to make healthy choices that also fulfill our desire for pleasure when filling our tummies. 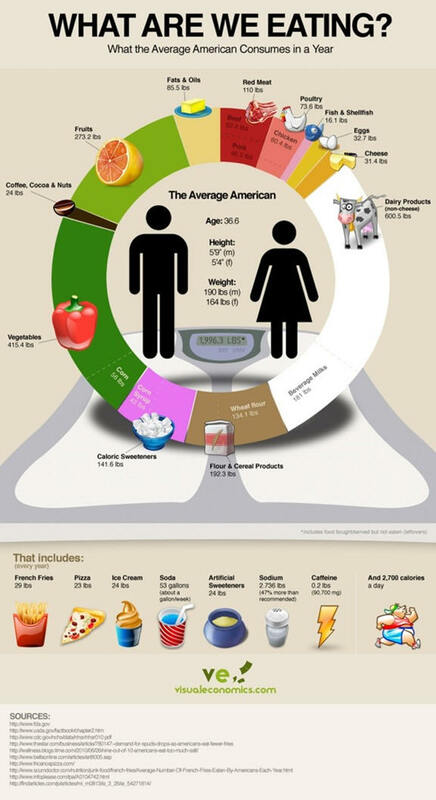 The average American eats almost 1 ton of food per year. According to 2011 USDA data; note that this includes leftovers (food bought, served but not eaten); and although our average American consumes 415 pounds of vegetables, a high proportion of these are starchy corn and potatoes. - Foods grown in your native environment. i.e. locally grown and seasonal. - Ensure healthy fats in your diet. Includes animal sources and Omega-3 fat, with balanced intake of Omega-6 fat (Eliminate typical grocery store polyunsaturated vegetable oils). Nutritional Supplements. Unfortunately, in today's world, numerous factors have caused a depletion of available nutrients in our food supply. This author believes that Christ's sacrifice on the cross abolished the need for anyone to obey the O.T. law. Since now being under grace, God has given us freedom to determine our own action. However, by studying the O.T. law, it is soon realized that there is evidence that the law was not just a list of arbitrary instructions, but rather was intended as a blessing to protect and enhance spiritual, emotional, social and physical health. As such, a wise person would evaluate the wisdom given in those instructions.